The 0.91-inch is one of the most popular sizes of #OLED display in the market. 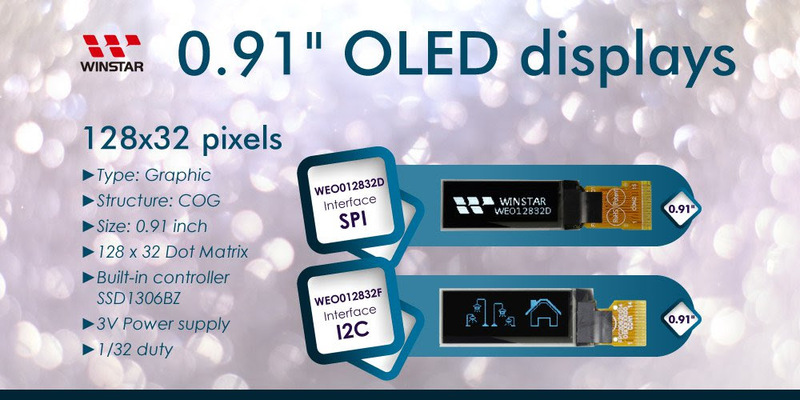 Winstar offers two models of 0.91” OLEDs, WEO012832D and WEO012832F for options. These OLED modules are small, ultra thin, lightweight and low power consumption. They are great for handheld instruments, meters, smart grid, wearable device, E-cigarette, MP3, #IoT, etc. The standard emitting colors for WEO012832D/WEO012832F are available in white, sky blue and yellow. These modules can be operating at temperatures from -20℃ to +70℃; its storage temperatures range from -30℃ to +80℃. Below are the basic information as reference. More details please check Winstar website or contact our global distributors.